“Wait, these are all of the questions?!?! How are they supposed to match me up with a roommate based on only 5 questions?” This was what I wondered before my freshman year of college as I was filling out the survey which would determine who I would live with for the next year. When you are going away to college it can be a nerve wrecking experience not only because you are entering a completely new academic setting but also because you are being thrown into a totally strange social/living situation; how weird is it that we just pack up and move into such close quarters with someone we don’t even know? I’ll tell you, it’s wicked weird. There are always both success and horror stories from freshman year roommates, which you often can’t control. What you can control however is the first contact you make with your roommate and the first impression you make. I’m going to share with you my own story and give you some tips on how to contact your roommate for the first time. You’ll probably receive your roommate’s email and I would recommend exchanging phone numbers right away. It just makes communicating so much easier! Once you can text one another, that’s when the fun begins. One of the first things my roommate and I started talking about was what books we like to read and the movies we enjoy watching; pretty safe and standard stuff. I’d say this is a good way to begin. She then asked me why she couldn’t find me on Facebook. Ok here we go. So, I just recently got on Facebook (and only really to connect with other bloggers) which means that my roommate couldn’t Facebook stalk me. We sent pictures to each other to see what we looked like and my first mistake was to send one with my sunglasses on. I don’t know what I was thinking! She couldn’t even see my face (insert face palm emoji here). We moved on to going over logistics, like who would bring the microwave and fridge. Through talking we also discovered we had purchased the same comforter #matchmadeinheaven. And that was about it for our first conversation! Do exchange general pleasantries and talk about basic, common interests. Don’t make any snap judgments about your roommate. I really want to stress this! Whether you think you’ll be perfect together or already feel like you want a switch, absolutely reserve judgment until you’ve spent time together. It takes time to get to know people and you want to avoid going into your new living situation with your mind already made up. Do go over logistics. Find out who will bring the microwave, fridge, tv, etc. 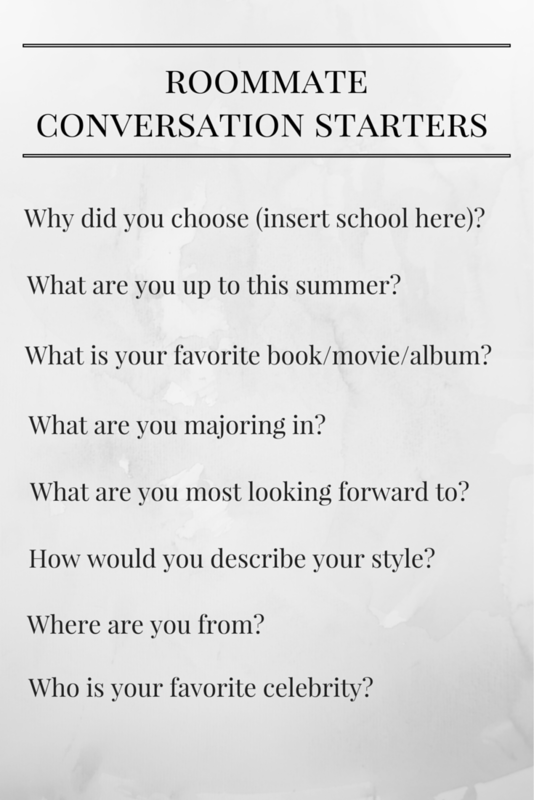 Don’t ask potentially offensive or insensitive questions (see the conversation starters below). The main thing to keep in mind is that you want to be truthful, authentic, and open-minded. You’d be surprised how well a few questions can serve to match you up with a great roommate! My roommate and I from freshman year are still very close (she’s one of my best friends) and we couldn’t have been happier together. 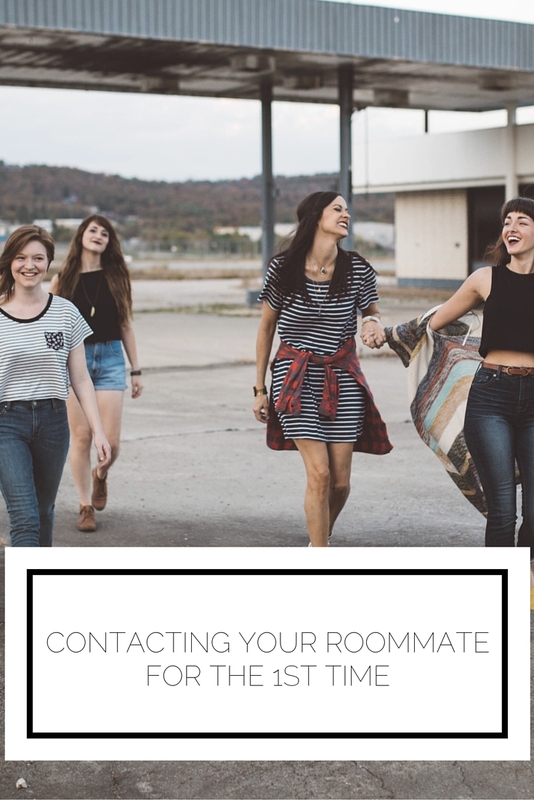 Are you contacting your roommate for the first time? What tips and tricks do you have if you've already done it? This was originally a guest post on Southwest Prep.